"There were 4 Singhs in the basement of the Bunga Jassa Singh Ramgarhia who were giving a tough fight to the forces. They had also pulled down 3 personnel of the army who had ventured too close. The authorities wanted these people to surrender but they wanted a mutually responsible person to mediate. I was then asked to mediate but first of all I asked the army officers of a guarantee that none would be shot only arrested and later law would take its own course. They were not ready for this and wished me to talk to the Brigadier who too was noncommittal. They then asked me to inquire if the three army personnel were alive. The reply received was that no live personnel were there in the basement. At this the Brigadier asked me to leave and that they would themselves deal with them. These men in the basement fought the whole day, the whole night and also the next day when Giani Zail Singh came to visit the ruins of Akaal Takht. Some thought that they had also aimed for Giani but it was not so. These people did not know that Giani was coming. If they knew before hand, they would have definitely put a bullet through the 'tyrant' but they were totally cut out from the outside world. A colonel of the commandos attempted to flush out these men in the basement with a gun and light arrangement but as soon as he entered the basement, a burst of LMG wounded him and it was later learnt that he had succumbed to the injuries in the hospital. Two cannons were reemployed to fire at the Bunga, gaping holes were formed on the Parikrama end but the men within were safe. I saw from the roof of Harmandir Sahib that two grenadiers had been put on the grenade shooter and a continuous barrage of grenades was being used but they still survived. Burnt red chilly bags, chilly powder and smoke granades were thrown in; one of them came out to be greeted with a hail of bullets while the others finally were silenced on the 10th." Thus, on the 10th June the battle of Amritsar was officially concluded as the guns finally fell silent. The military operation was unprecedented in Indian history, as the might of the Indian Army was unleashed, complete with full fire power and heavy artillery on its own people. Following the battle, the government was embarrassed, General K.S Brar on the 2ndJune 1984 had stated that "we shall see to it that they are on their knees in just two hours"; The Sikh Unrest and The Indian State, R.N. Kumar. Yet it took 10 days for the army to completely defeat the Sikh fighters. Other than pride, this was damaging for the Indian Government as the operation was supposed to happen under the cover of darkness, or rather a complete media blackout. This would have ensured that no one would have known what happened between the inner walls of the complex. 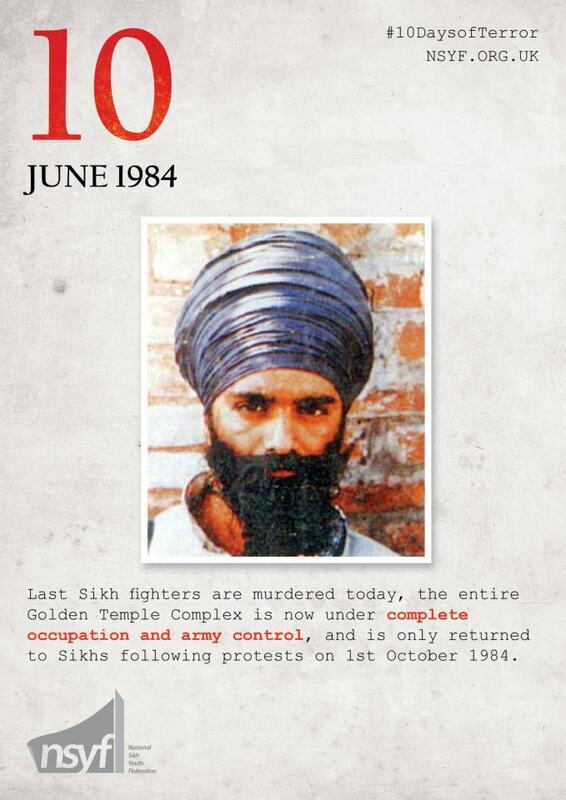 However, as the fighting lasted over a week, word began to spread, rumours spread throughout villages in Punjab and army bases across India, which resulted in a huge outpouring of grief and anger from Sikhs across the world. Soon after the massacre the government disinformation campaign went into overdrive to create legitimacy for the action. The goal of this disinformation Campaign, according to Subramaniam Swami (Indian politician, academician and an economist) was to 'make out that the Golden Temple was the haven of criminals, a store of armoury and a citadel of the nation's dismemberment conspiracy; Creating a Martyr - Imprint (1984), Subramaniam Swami, p 7. One of these myths that was propagated by the State media, was that the fighters were highly trained and possessed sophisticated weaponry, courtesy of Pakistan. In regards to this the Daily Telegraph, London (June 15, 1984) wrote, "The Government is now energetically insisting that the Sikh insurrection in the Panjab was a deep-seated conspiracy of a certain foreign power or when pressed, claims that some of the terrorists were trained in Pakistan. This is the first time that such a claim has been made, and it smacks of Mrs Gandhi's playing the familiar old Pakistan card for all it is worth. After all, there is an election looming on the horizon and a touch of war fever may not do any harm. But in the long run this sort of propaganda will not solve the Panjab's underlying problems." In regards to the weapons that the Sikh fighters actually had a retired brigadier, then a lieutenant colonel, recalls: "My unit was sent to the Darbar Sahib complex after the Operation was over to assist in post-operation duties. I reached Amritsar on June 10th. On the basis of my personal knowledge, I can say that the government White Paper's list of arms recovered does not accurately reflect the arms in the possession of the militants. I would put the number of actual combatants on the other side at around 200"; Politics of genocide: Punjab, 1984-1998, Inderjit Singh Jaijee. In an essay contributed to "The Punjab Story", Lieutenant General J.S. Arora writes: "there is a need to correct the picture that has been painted by the media that sophisticated weapons were found inside the Temple..The impression that has been built up in the public mind of foreign governments deliberately arming the terrorists with a view to overthrowing the government is grossly overdone." Telegraph London (June 15, 1984) published the following report from David Graves: "The Akal Takhat looks like it has been bombed. It looks like a building in Berlin after the War. Every building in the complex had been riddled with bullets and there was still a stench of death in the air." Meanwhile The Times of India (June 10, 1984) headlined on the front page a Press Trust of India report saying, "Terrorists made a desperate attempt to blow up the Akal Takhat, killed a number of men, women and children, and unsuccessfully tried to escape with huge amounts of cash, jewellery and other valuables after their leaders were killed in the action on June 5. The Akal Takhat was not damaged in the Army action." Brahma Challeney of the Associated Press (AP) of USA was the only foreign correspondent who managed to stay in Amritsar during the attack, and was one of the first to publish reports that sikh pilgrims were executed after the attack. For his troubles he was arrested and also charged with sedition. Slowly with research and initiatives like #10DaysofTerror we can challenge the unfounded allegations and falsehoods circulated in 1984. We thank everyone who supported the campaign, and urge everyone to learn more about a very significant and recent part of Sikh Political History. One small step is to read this brief fact sheet which provides a general overview.